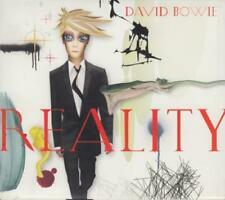 Here is the Cd Album - David Bowie - Reality. In very good condition. Ships to the UK only. The booklet is in excellent condition. David Bowie - Reality (5125552). 2003 UK CD. This CD Is In Excellent Condition . Rest Of World - £3.00 and £1.50 For Each Extra Item. Artist:Bowie, David. Your item will be previously owned but still in great condition. The disc will play perfectly without interruption and the case, inlay notes and sleeve may show limited signs of wear. 3 Ziggy Stardust 3:11. 5 Wild Eyed Boy From Freecloud 3:08. 15 Band Introduction 0:34. 11 My Death 6:00. 1 Opening Credits / Intro 6:53. DVD Regions. 21 End Credits 2:04. Release Date: 20/09/1999. Publication Date: 20/09/1999. VeRO & IP Rights. We promise to do everything possible to put things right for you. Orders will be fulfilled by our own warehouse or a 3rd party supplier at our discretion. David Bowie : Black Tie White Noise CD (2003)Title: Black Tie White Noise Artist: David Bowie Genre: Rock/Pop|Rock Duration: 56.20 mins Format: CD / Album Type: CD No. of Discs: 1 disc(s) Studio / Label: EMI Music UK UK Release Date: 06 Oct 2003. David Bowie Reality music two CD set. Featuring a special edition of Reality bonus disc. "Reality" 4:23. Limited edition Digipak bonus disc. "New Killer Star " 4:40. "Never Get Old" 4:25. "She'll Drive the Big Car" 4:35. Black Tie White Noise. About Speedyhen. Title: Black Tie White Noise. Title : Black Tie White Noise. Creator : David Bowie. Binding : Audio CD. Format: CD. Format : CD. Product Category : Music. Condition : Very Good. David Bowie - Reality (2003) CD NEW/SEALED SPEEDYPOST. Loving The Alien - Scumfrog vs Bowie. Shout (Original mix) - Solaris vs Bowie ­. China Girl (Riff & Vox Club Mix). 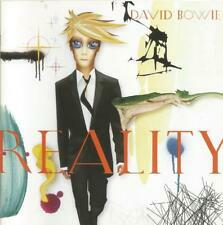 David Bowie - Reality (CD & DVD) (2003). Condition - Used. The CD has been used but is in good condition. The case is intact. Format: CDAudio CD. Marsh Barton. We provide free care for patients and their families. We have a specialist nursing team working at the Royal Devon & Exeter Hospital. Like all proper Dave albums, Bowie's 26th has at its core a concept, around which 11 songs uneasily cluster to articulate the master's daft vision. (Or, as he chuckles: "The basis (of reality) is more an all-pervasive influence of contingency than a defined structure of absolutes."). HERE WE HAVE A CD ALBUM FOR SALE. Excellent condition, disc is pristine. DAVID BOWIE. ARTIST: -DAVID BOWIE. TITLE: -REALITY. (and the main man to boot!). Vinyl 12" Singles. After all, you're not the only one who leaves it till the last minute! - Run by knowledgeable enthusiasts. Up for grabs is this digitally remastered CD by David Bowie. On the EMI label, the catalogue number is83338 2 4 and the date of issue is 2003. Soul / Dance / Rap / Reggae / Ska. The Wedding 2. You've Been Around 3. Black Tie White Noise. The Wedding Song. Miracle Goodnight. Pallas Athena. Nite Flights. David Bowie - The Best Of 1974-1979 CD. Condition is Very Good. Dispatched with Royal Mail 2nd Class Large Letter. David Bowie - Best Of 1974-1979 The (2003). Condition is Very Good. Dispatched with Royal Mail 1st Class Large Letter. Ziggy Stardust And The Spiders From Mars Part 1, Translucent Red disc in Cardboard Sleeve. 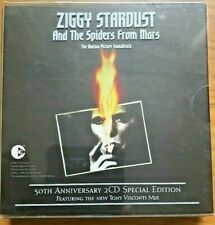 -Ziggy Stardust And The Spiders From Mars Part 2, Translucent Red disc in Cardboard Sleeve. Box Set,Box, Slipcase, 30th Anniversary 2CD Special Edition. Title: David Bowie - Reality (2003). Artist: David Bowie. Album Notes. EAN: 5099751255529. Recording Mode: Stereo. Recording Type: Studio. Number of CDs: 1. Fall Dog Bombs the Moon. David Bowie - Reality. 2003 Columbia Records CD album. Condition Mint (using Record Collector magazine gradings). Product Details Fall Dog Bombs The Moon. She'll Drive The Big Car. Looking For Water. Ziggy Stardust & The Spiders From Mars - The Motion Picture. Ziggy Stardust. DAVID BOWIE. Cracked Actor. UK £0.00, extra copies add £0 per item. UK Parcel Force 48 hour £9.50, extra copies add £9.50 per item. I Keep Forgettin. Tumble and Twirl. Neighborhood Threat. Artist: DAVID BOWIE. Title: REALITY. Label: COLUMBIA. Year: 2003. 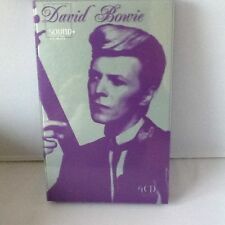 David Bowie 4 CD Box Set. Everything looks well cared for, no marks that I can see on cds, box or cover. Sound Vision. Fall Dog Bombs The Moon. Shell Drive The Big Car. Looking For Water.